I am obviously head-over-heels, unapologetically, 100%, all-day-every-day in love with with grilled cheese sandwiches. I have had quite a bit of fun this month coming up with new recipes to share and, truth be told, I still have a few other ideas in my recipe notes to share in the future. Maybe we will make this Grilled Cheese Month thing an annual celebration? If more truth is told, there are SO many amazing grilled cheese recipes out there so I couldn’t help but organize a list to share. So below you will find 40+ grilled cheese recipes from around the web. I have left it open-ended with intentions on adding to it as I find more, too! If you have a favorite grilled cheese recipe, please feel free to leave it in the comments below. Happy cheesing! What a great roundup! I love grilled cheese and I’d love to sample of one each! I want one of each. For lunch. Today. Great list and thanks for including my pizza grilled cheese! All of these are insanely creative! I think I know what I’m having for lunch today…. So I’ll just eat one of these a day, from now until next year’s grilled cheese month. Perfect! What a positively fabulous collection! I’m pretty sure this could just be my menu plan for the next few weeks. Thanks for including my roasted red pepper grilled cheese friend! Hey thanks, lady!! I want IT ALL. OH YES!! I’ll take two of every single sammie. And thanks for include my bacon sammie! Such a great round up, now I’m craving one of each! I really wish I could re-do April and fully celebrate Grilled Cheese month right by making each and every one of these grilled cheese’s (is cheese’s a word?). Love all the gooey cheesy deliciousness!! KILLER round-up! So many incredible grilled cheeses. I better get some more cheese and butter! OMG. 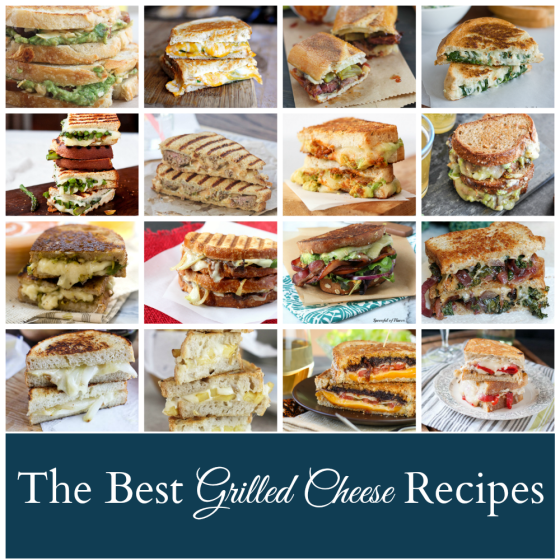 You’ve got my mouth watering with all these scrumptious grilled cheese recipes, Cassie! Where to start?! OMG! They all look so good! Oh man, I seriously want ALL THE GRILLED CHEESE.